The note on the Early Access alpha describes the design and development process as "fully transparent," and says that the release is "your chance to experience and make a difference in H1Z1 as it evolves throughout the development process." All of which is good, if you're into that sort of thing, but it also carries a number of caveats that are sometimes easy to overlook. 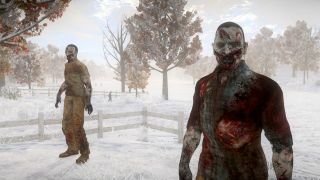 Thus, it continues: "The H1Z1 development team will continue to create new features and may make significant changes based on the needs of the game. Those who choose to purchase Early Access should anticipate an evolving feature set, bugs, incomplete content, missing features, and potentially game breaking issues." Don't go into this if you're looking for rock-solid zombie fun, in other words, but if you have the patience for early-stage development and want to be part of the process, then here's your ticket. Speaking of which, H1Z1 will be available in two editions: Standard, with three event tickets, one launch crate key, and two crates; and Premium, which will include 24 event tickets, three airdrop tickets, four launch crate keys, six crates, and an aviator hat crafting recipe. No prices are listed (although the standard edition will apparently set you back $20) but everything else you want to know is right here on Steam.